Elettromedia presented many, important news for the car audio market, achieving an amazing success among the fans who have been highly anticipating the Las Vegas CES Show, to get the heads up on the latest projects designed by the Elettromedia R&D. The 2012 International Consumer Electronics Show, the most important event for consumer electronics at an international level, was held from January 10th to 13th in Las Vegas. This year the Audison and Hertz fans had the possibility to follow the world wide preview of our new products through our Social Network Pages (Facebook, You Tube and Twitter). This way the exciting comments of those who had the chance to personally attend the official presentations merged with those posted by the on-line fans. Also this year, the Elettromedia staff’s passion, know-how and bent for innovation received world acknowledgement with a resounding triumph. 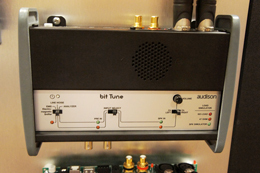 Among the new products introduced by Audison, two new hi-tech products, designed, following the tradition, with the main goal of optimizing the audio system performance without any compromise: Audison bit Tune, a revolutionary auto-tuning system for the Audison bit processors, with a large array of additional features for the audio system installation and check; Audison bit Play HD, a 24bit/96kHz high-definition media player specifically designed for integration into OEM or Aftermarket systems as well as to realize an Audison Full Digital Audio system. Regarding Hertz, the Elettromedia staff presented in worldwide preview the new Dieci.3 line: a complete product range, from the tweeter to the sub in amplified box, designed according to the latest and most up-to-date technologies; thanks to them, the Dieci.3 line can boast efficiency levels and a frequency response linearity proper of components belonging to higher ranges. Two were the demo cars displayed at the Elettromedia Showroom: one for Hertz, a Fiat 500 equipped with the brand new Dieci DSK 165.3 system and the EBX F20.5 flat sub box, amplified by a Hertz HDP 4; it also featured the Audison bit Ten which had the task to take and elaborate the factory head unit optimizing it for enhanced performance. The installation was made by the specialty store “Traffic Jams” (California, USA). Regarding Audison a VW Golf GTI was displayed, featuring a Full Digital Audio 24bit/96kHz system supported by the Audison Voce products and managed by an Audison bit One processor; the whole project was developed by the specialty store “Mobile Solutions of Calgary” (Alberta, Canada). Videos of the Presentations can be viewed on the Audison You Tube channel.